A fundamental skincare rule, as we’ve said many times: Your skin type should determine which products you use. For example, someone with dry skin shouldn’t be using the same products as someone with normal to oily skin. However, despite differences in skin type, there are certain universal skincare concerns, such as dry lips, rough skin from the neck down, and the need for facial hydration. The type of products that address those concerns are the same, no matter your age or whether you have normal, oily, combination, or dry facial skin. The Best Skincare Products That Work for Everyone! Lip Care: For the most part, everyone has the exact same type of skin on our lips—no pores, no oil glands, extremely sensitive, and prone to excessive dryness. To keep lips lusciously soft and moist, apply a lip balm with NO sensitizing ingredients at night and a balm rated SPF 30 or greater for daytime. Our LIP and BODY Treatment Balm for night and RESIST Anti-Aging Lip Gloss SPF 40 for daytime will do the job beautifully! Body Care: From the neck down, everyone generally has the same need for hydrating moisture; skin-smoothing exfoliation (no harsh body scrubs; instead, use gentle leave-on AHA or BHA exfoliants, which are far more effective and don’t damage skin); and vitally important skin-restoring ingredients like retinol and niacinamide. 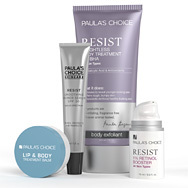 Paula’s Choice body-care products provide all of that and much more. Primer: If you wear foundation, you want it to go on perfectly smooth. Our RESIST Smoothing Primer Serum SPF 30 creates a perfect canvas for makeup application. It’s exceptionally lightweight and, unlike most primers, adds extra sun protection to safeguard your skin, plus antioxidants for added defense. Eye-Area Care: The eye area has almost no oil glands, so for most people eye-area skin can be dry. This area also ages the fastest because of facial movements and the actual structure of the eye area. Moisturizer for around the eye is as basic a need as it gets in skincare; whether you use your facial moisturizer around the eye area or a specially formulated eye cream or gel, eye-area care is a must-do, twice a day. Boosters: It’s hard to imagine, but true, that our skin has anti-aging needs even in our youth. The primary culprit? Sun damage! Moisturizers with sunscreen are vital (you've heard us say that a thousand times before! ), but you need to choose a formula specific to your skin type. To help restore and defend skin, certain ingredients “boost” skin’s ability to renew itself, refine pores, and maintain a healthy-looking, normal balance. Everyone can gain amazing benefit from regular use of either (or both) our 10% Niacinamide Booster or 1% Retinol Booster.